Above all the Chosen are a roleplaying group, and this forum is the place to do just that. All posts are expected to be in character except when specifically noted otherwise. A few rules to keep it fun for everyone are posted within, please read them before posting. Otherwise we encourage everyone to participate. Please keep the out-of character discussions to the Out Of Character forum. Kalannar shrugged when she didn't divulge the source of her grief. He figured she may in time, though was dissapointed a bit that she had not confided in him. He'd swim to shore then, and would work on placing his clothes once more before he'd run after her, quickly catching up. Feeling he should give it one more shot, he attempted to prod at the issue once more, figuring if he didn't suceed this time, he'd let it drop. "Ya know. No' answerin' ain' gonna 'elp. If anythin', it will make m' more curious." She was panting a little, still smiling, though that smile faded quick as she stopped short, taking in the scene before her. The opened gate of the stable, the elven child on the ground in the puddle of his own blood. The three figures nearby. [i:3d19yq0o]...What kind of madness is this? [/i:3d19yq0o] Her lips tightened and Luexena peered from one to another a moment, then made her way to the boy, scooping him up in her arms and carrying out with her, ignoring the crimson blood of the slain staining her white shirt. Her eyes locked upon the child's face, the face still twisted in horror, even in death, then she looked between the people again, silently. [i:3d19yq0o]Kalannar, guard me, please. [/i:3d19yq0o] Her voice sounded a bit husky as the woman knelt now, placing the light body of the elven child upon the grass before her, the moonlight only made the boy's face appear even more pale than before. Her left hand slipped to the pouch on her belt, rummaging in it hastily. Her right one stroked the child's hair tenderly before pressing to his neck, she was checking his vitals now, appearing focused on her task. Luexena pulled the boy's shirt up then, frowning as she did not feel any pulse, and examined the wound. Kalannar stood somewhat dumbfounded as he looked from her, to the child, and then to the others. Shrugging, he'd move into the path between her and them, a hand moving to the hilt of the rapier at his side as he glanced back to Luexana from time to time, to see how the child was doing. [i:2ev2jqwc]Righ'. S' wha' 'appened wit' th' kid? [/i:2ev2jqwc] He asked the group, his eyes somewhat narrowing as he awaited a reply. OOC: Think nothing of it, V- He'd never expect him to be!! And I'm liking where this is going. Some interesting interactions going on here. IC: Hearing Onix's words, he sighs, and stares back at the clone steadily, but with a look in his eyes that makes them appear as cold and hard as their icy hue would suggest. "Don't patronize me, Onix. I've been through it too. Most likely we ALL have here. Otherwise, most of us would still be down among the spider-kissers. But the difference is, SOME of us choose RESTRAINT in such situations. If you had any idea how many times I've wanted to twist the knife in the back of my family for what they did, you'd never believe I was the person I am." He stares Onix in the eyes for a long moment, before he continues quietly, but with a dark edge to his tone. "But it does not matter if it was a horse, a friend, or the person we most love- to simply turn around and commit the same crime in retaliation is no better, nor does it do anything but make the situation worse. Because now she has to live with knowing that no matter the excuse, what she did was wrong. And it still does not bring EITHER of them back. So she has merely made her own pain worse, and caused yet more sorrow for the family of that child. For all we know, he may have believed he was simply doing the right thing to ease the creature's suffering the only way he knew how. So do not be so quick to judge when we know only one side of this matter." At that, he crosses his arms over his chest, and gives him a warning glare. "And if it comes to drawing blades, so be it, though I do not wish to fight you, friend. Being a soldier means making hard decisions, and living with them. But you are not there now. Sooner or later, you are going to have to realize that you are not that person every minute of every day. Because if you ARE, then you really ARE nothing more than a tool for those who made you. And I would like to think you are more than that. The question is- ARE you? Only YOU can decide the answer to that." And so it began, Onix and Lothir were verbally challanging each other, over what? The essence of the downfall, of what she had done. A shiver sent the hairs on the back of her neck standing quite erect, goosebumps rising over her arms as she hugged her cloak tighter. Infront of her, the clone seemed to be on her side, but she feared that he would indeed end up believing something the bard would say, and then what? [i:2d76or8b]They will attack you! [/i:2d76or8b] Her mind shouted, she cringed back as Onix's voice vibrated with hatred through the air; [color=darkblue:2d76or8b][i:2d76or8b]"do not be presumptions to judge her, Lothir. I say that because I have done the same. I have been in her position,"[/i:2d76or8b][/color:2d76or8b] he was furious, more than anything LiNeee had seen in a long time. She took a step back, barely noticeable though. He wasn't finished, LiNeee made a point of stepping to the side where Onix would hide her from view, however she could still see the bard from around Onix's neck; [color=darkblue:2d76or8b][i:2d76or8b]"Yes, my bard, I do speak of children that deserve to be protected and sought after; but do not think that I have not killed them before. As much blood of theirs is on my hands and blades as is. I say I would've have done the same because I have done the same. I know from firsthand experience what she feels, because I've been there before. Who's right is it for someone to take away one's only family, hmm? If it's someone's family, regardless of what kinda species they are, who has the right to pronounce death upon that family member, regardless of how sick or ill they may be? NO ONE!!! "[/i:2d76or8b][/color:2d76or8b] He turned to LiNeee, and she swore she saw those eyes glow crimson, but she didn't care, at that moment she wanted to bundle herself up in his arms, thank him, love him? No, she couldn't love someone, she had just killed a child, and that would stick with her forever. Head bowed, she didn't listen with full intent on the next things that the clone and the bard said to each other, though when Onix held his hand out for her, she only hesitated but a moment, before sliding her own hand into his and looping her fingers around the side. The tears still came steadilly, she turned to the bard with such hatred in her gut, the hand that wasn't in Onix's was sitting on the hilt of her dagger. [i:2d76or8b] "Perhaps,"[/i:2d76or8b] she said after he was finished talking, [i:2d76or8b]"perhaps I will have to live with this for the rest of my life, but you didn't see his face,"[/i:2d76or8b] her voice was monotone, like she was a recording of sorrow. [i:2d76or8b]"His face vibrated with vengeance, and maybe you don't understand that, Lothir, but I do. And I know that what he did,"[/i:2d76or8b] she looked over her shoulder at the stables; her heart sank, [i:2d76or8b]"he did it to get at me. So yes, I will live with his blood on my hands, for the rest of my life. But I will also live without my family, without a companion I've had since before I can remember. I have to live with-"[/i:2d76or8b] Voice breaking, LiNeee bent her head and let a sob rip through her, she had no more to say. Seeing her tears, something in him finally snaps, and he turns aside to hiss a string of horribly uncouth curses in drowish. Then he turns back, staring her in the face. There might be a hint of pain behind the icy stare, but it is barely discernible. "Yes, you will. But truly, all motives aside, can you honestly say that you did not provoke it? How long have you been above? Such quick and rash actions are going to get you killed one day. This is not the world our people come from, where such things would simply be overlooked as a matter of convenience. Here, there are consequences to everything we do. Try to remember that." 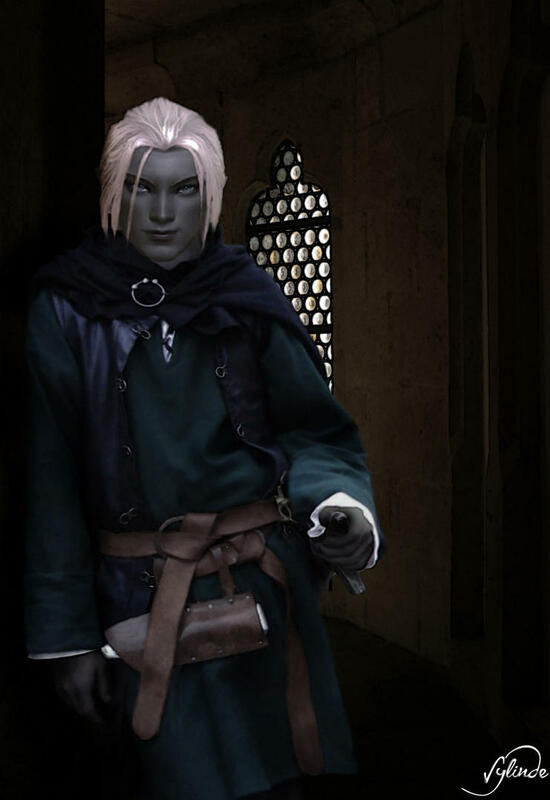 He looks out across the yard, where Luaxena and the odd half-drow are, and frowns. "I suppose it must seem as though I judge you too harshly. But I have my reasons for that, too. You see, I also know what it is like to have lost the only family I ever really had. Though my blood-kin still live, they are no longer family to me. The only one who ever mattered is dead- by THEIR hands. And yet, as much as I hate them, I cannot presume to take vengeance on them. That is for gods and lawful authority to decide. Perhaps you could learn something from that. To stay the hand is often more difficult, but it is a choice that one can more easily live with. At least then one does not have blood on one's hands adding to the pain that is caused." Barely catching the line of words, LiNeee's eyes widen only briefly. What on earth was he doing? Swinging the dagger up, she holstered it and placed a hand on her hip, [color=darkred:2rd06dv1][i:2rd06dv1]I hope you know that meant no sense, to me anyway. [/i:2rd06dv1][/color:2rd06dv1] Came Phoebeys voice, LiNeee grinned, she had forgotten the girl and her winged-horse was over there, but she ignored it, lifting a hand to wipe the glistening tears from her face. "And still you do not seem to understand." He says sadly. "LiNeee, it was never your place to judge what he did or did not deserve. Only the gods and the appointed authorities of the land are allowed that right. Otherwise, all the world would be little more than chaos and lawlessness. It is that sort of thinking which destroys the things you speak of. Honor and integrity do not come from being true only to oneself. They come from knowing what is right or wrong, and acting accordingly. And yes, there will always be someone who makes it more difficult- but killing those who offend us or who cause us grief is never the answer. It CANNOT be, or life becomes worthless. Taking a life should always be the last resort, and even then, only in defense of oneself or one's loved ones. Note, I said DEFENSE, not vengeance." He pause, and holds out a hand to touch her shoulder, but the look of almost fatherly disapproval is still there. "You will find others to care for in time, but you can never take back what you have done. And would you truly want your memories of your horse tarnished by such an act? Knowing that you spilled blood because of her? It diminishes us when we do such things. And the memories of out loved ones, as well. Try to remember that." Behind the three of them, Phoebey had walked from the water and set the beauty go. Phoebey had watched, waited, as the beast had taken flight, and than she turned to LiNeee and the two males. One she was holding hands with, the other, conversing. Never had she seen LiNeee so close to another being before, never had she seen LiNeee let her self be open to such lecture's. It was nice. Phoebey let out a breath she didn't realise she'd been holding and dipped her toes into the water, leaving LiNeee to her apologies and self pity, she wished she could be as brave as the girl, a warrior, a Drow. But no, she was a child of the night. LiNeee sniffed, bowing her head down, the moonlight igniting her hair in such a way as to let it shine. "Friendship? We shall see. But you are right- you still have much to learn. I only hope that this incident does not end with you swinging from a rope to serve 'justice' before you have that chance. But think on what I've said. Life is far too precious to toss aside, even in anger or grief." She scoffed and gave a shrug of her shoulders. [i:36glflen]"Everything happens for a reason, because what you do in life is insignificant. "[/i:36glflen] she simply offered, letting go of his hand and shrugging his off her shoulder. She let go of Onix's hand aswel, looking up to him and giving him a small smile before heading into the Inn by herself, wondering if he would follow. Either way, she didn't mind. [i:36glflen] Oop my que,[/i:36glflen] Phoebey hobbled up the hill and darted inbetween the two males, [i:36glflen]"excuse me, pardon me,"[/i:36glflen] she said, skipping after LiNeee into the Inn.